5 Star Review Luxury Condo in THE BEST location! The photos are exactly as the condo is; BEAUTIFU! The 3 en-suites allowed the 3 couples their private areas. The wall that separated the dining area to the outside was one most of the time providing a fabulous way to enjoy the sights and weather yet still have access to the comforts of the condo. The location can not be better! Across the street is the pool. Behind the pool is the beach. At the end of the beac is the famous Lava Lava restaurant and club. Tropics Sports Bar is close by too! It was also great that any time we had a question, Wendee took care of us. Make you vacation "the best" and book this place! 5 Star Rating Beautiful view, villa and resort! Our family of 6 just returned from our lovely stay at Kolea 7F ~ this was the best part of our vacation! When you first walk in through the private entry from the elevator and open the door ~ the view is even better than what the pictures captured. The villa is well-maintained, with beautiful top of the line appliances ~ every luxury and convenience that you would ever need! Our family has stayed in multiple villas on Oahu, Maui, Kauai and Hawaii ~ and this by far, has been our absolute favorite villa! The view is unbeatable, the proximity to the pool, the Beach Club as well as the A Bay, and nearby King Shops & Queens Marketplace, all just a few minutes drive away. Wendee and her team were so helpful, accommodating, and attentive with our requests. I would definitely stay at this villa again next time we are back on the Big Island! 5 STAR REVIEW Great location, nice condo, roomy and quiet and close to everything. Weve been staying at Kolea for several years and always had a lovely time. Wed stay here again in a heartbeat. Great ground floor unit. 5 STAR REVIEW We have completed our second stay in C 204 at MLP. Our first stay was two years ago and the unit is just as nice as the first time. C 204 is exceptional in all aspects. It is tastefully and comfortably furnished. It is furnished as a private home, not a rental unit. While we do not use all that the kitchen has to offer, we appreciate knowing appliances, kitchen tools are there if needed. The bedrooms and bathrooms are beautifully appointed, and both beds are comfortable! Management is very prompt if you need anything. The location of C 204 is very private and quiet with expansive views of the ocean waves crashing on the lava cliffs and views of hole #12 and #15 which is the signature hole on the south course. We believe that Mauni Lani Resort has a very central location to many activities on the Kohala Coast, and it is easy to take off north or south to do some sightseeing. The property offers two golf courses, shopping mall with grocery store and good restaurants, and a private beach. Although the Mauni Lani hotel was closed for remodeling, it is a very pleasant walk from C 204 to the hotel and beach. I have to mention that management makes the check in and check out process very smooth. They are also very prompt if you need anything. We are looking forward to our next stay in beautiful C 204! 5 Star Review LOVELY CONTEMPORARY STYLE HOME We stayed in this unit for the second half of our holiday and were so happy that we found another place that was also amazing. It had everything we needed and more. Clean, spacious and management was very helpful. Would definitely book again. 5 Star Review Beautiful condo with stunning views! We had an amazing stay at this first class property. The condo was beautiful, extremely clean and well stocked. Our entire family, including teenage boys, had a wonderful time. We were close to the beach, shopping and delicious restaurants. Will definitely return and stay again. Thank you!!!! 5 Star Review Great unit, with fantastic view of the water. Couldnt have been more comfortable. Kolea is in a great location. Close to everything. Hopefully we will be able to rent again soon. Quintessential Hawaii... 5 Star Review An absolutely outstanding property that we will always stay in on the Big Island! The rental was clean, spacious and AC was wonderful after spending a day out in the sun. The nearby beach on the property was very enjoyable and golf courses were in great condition with awesome views. My family and I would definitely rent this unit again when returning to this island without reservation. We had a wonderful stay at 15J. The location was perfect and the condo itself far surpassed our expectations. it is a great location and the amenities of the complex are first class. I do not like the feel of big resort hotels and crowds and this complex offers such a peaceful vibe. Yet nothing was lacking as the pool and beach were wonderful. I cant say enough great things about it, and especially about the excellent service from start to end of the property manager Wendee. We have rented VRBOs many times and this was the best by far. I highly recommend to anyone seeking a luxury rental without any worries!! Very nice place, great location This was a fantastic condo for our family. The location within walking distance to A-Bay beach as well as the Kings shopping center and the Queens Marketplace was very convenient. I chose this condo development for the location and convenience. I chose this particular unit because the third bedroom contained a regular queen bed rather than two twin beds or a fold-out. My youngest is 63" so doesnt fit on a twin bed. He enjoyed the full size accommodations. If you are splitting this condo for three couples that queen bed would also be appreciated. All of the beds were in great condition and very comfortable. Thanks for the great place. I will be recommending this to my friends if they are considering visiting Hawaii. Beautiful, clean, comfortable home with top notch amenities This is the second time in a few years that we have stayed at this particular unit in Halii Kai. We have stayed at others in the resort as well, but this one stands out in its comfort and cleanliness. The kitchen is so well equipped and the laundry room contains everything you need for a day at the beach. The beach club is very beautiful, right on the ocean, and the attendants there are always friendly. My husband loves the ocean view gym! Wendee the property manager was very accommodating in letting us have a late check out on our last day, as my husband works while we are visiting the island, and he was able to relax and enjoy the amenities without having to rush out by regular check out time. We will definitely be back! Very clean, comfortable, exceeded expectations! Lovely property, we plan to return again next year. Kolea 4F is an amazing unit. It is beautifully appointed and very large. We are a family of 5 and we found the unit to be very spacious The view is unbelievable. We enjoyed dinner on the lanai while watching one of the most beautiful sunsets. The kitchen has everything and the bedrooms and bathrooms are just lovely. The Waikoloa Resort is a beautiful location. If there was not so much else to do on the Big Island, we could have enjoyed the resort for our entire stay without leaving. We enjoyed the convenience of a food market and shopping near by. We enjoyed time at A-Bay - a beach walking distance from the condo. We also found the resort to be well located on the island for other activities. My family LOVED this unit and would come back again. We spent all our time relaxing on the lanai. My family gives this unit 5 stars. Amazing View will take your breath away From the second we opened the door and looked at the view we all took a deep breath and were overwhelmed with the beauty we saw! The condo was equipped with anything we could desire, the furniture comfortable, art work was beautiful. Wendee Aono is an amazing property manager as we knew from May when we were in another one of her properties here in Kolea, willing to help at a minutes notice if needed. We are thinking of returning with our family and renting 4F again. As far as we have seen there isnt another condo that compares as far as placement in the complex and the view. We saw whales, surfers being towed in on wave runners in the bay and were fortunate enough to have amazing, unobstructed sunsets every night of our stay. The pool and the beach access are very close and was used daily as well. We cant wait to return to 4F with our family! Great stay in Waikaloa It was a pleasure to return to Halii Kai and stay in 18D. For the 5th time. Thanks to everyone at Kohala Luxury Rentals for making our stay so memorable. Wendee, thanks for looking after all the small details that contribute to a fun time on the Big Island, it was hard to leave and we cant wait to come back. Wonderful Stay We thoroughly enjoyed our stay at this beautiful place. The condo itself is just as described - even better. The condition upon our arrival showed great attention to detail. The community area with pool, spa, etc. was outstanding! We loved the tiki torches and the beauty of the entire facility. Our third trip to the BI and this condo is THE best so far! We stayed for two weeks in late July and although it was El Nino and the hottest trip to Hawaii that we have experienced, we really enjoyed this condo. It was WONDERFUL! Everything you need to have a relaxing time. Working with Wendee was great, seamless, and because it was hot, we had to use the AC and the elevator a bit more than usual and glad we had both. These owners have thought of everything, and the "penthouse" was extremely quiet and had those gorgeous views for sunrises and sunsets. The kitchen was stocked with the essentials to get started, and we so appreciated this. Also, the beautiful decor, the well-stocked kitchen and the awesome master bath is truly what you see in the photos. Even though it was hot and humid we spent a lot of time on the lanai. Sliding those doors back in the morning when it was cool made the coffee taste better (even being Kona Coffee!) and the table and chairs were wonderful. In the later evening after being at A Bay or Mauna Kea beach, using the chaise lounges to relax with a glass of wine and then cook steaks on your own grill was a treat. (Our last place literally had a line at the grill :-( so having the summer kitchen was really worth it!). For the first time ever, we DID spend quite a few nights in the condo. And everything you would want for the beach is there, including a cooler. We have bought many chairs and coolers on our six trips to Hawaii. This was the first year we didnt have to!!!! I also want to say that this is convenient to the beach, pool, and you can walk to the Shops if you want. We also went to the Tropics Ale House (great mai tais!) and Lava Lava Club, Quinns, Don the Beachcomber and Orchid Thai in Kona. We also tried Monstera for the first time, and it was awesome (a must if you like sushi). Thank you to the owners for sharing this beautiful condo! So, I would like to recommend this place to others, but I really want to keep it a secret so we can get our dates for next year! We had a fabulous time in Hawaii and we will never forget this property. Staying in this home made our trip so special. The patio was out of this world and became our family meeting place for every breakfast and evening appetizers. Thank you. This unit is perfect for family vacation. It close to the beach and has an awesome ocean view. It is quiet and bird will wake you up in the morning. When we come here next time, for sure we will stay here again. I cannot say enough great things about this condo. It has stunning views and is a beautiful condo. The photos do not lie and I would say the view is even more impressive when you get there. The home is decorated very nicely and does not feel like a rental. The owners have clearly put a lot of thoughtfulness into the dcor. Its modern, and has a lot of authentic Hawaiian artwork. The kitchen is well stocked with all pots and pans you could need, as a nice selection of herbs and other pantry items. The beds are comfortable, as are the living room and outdoor furniture. We felt very relaxed at this condo. We have already booked next years vacation! I would also like to mention that Wendee is a wonderful property manager. I had a few questions before arrival and she was very responsive and accommodating. I had no issues with anything while there, but I feel confident she would have been helpful then also. Shes great! Everyone (age 8 - 70) enjoyed our stay in 4F. The unit is laid out well for different family members. 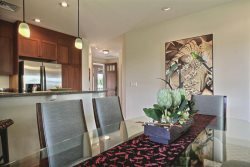 We loved the huge lanai, dining table and the well-stocked kitchen. There were lots of extras throughout the unit that made our stay even better. It was nicer than the photos led us to believe. The rental coordinator was super easy to work with. This was our second time on the Island but the first in Waikoloa. We liked having the grocery store and shops so close yet the property was very quiet and relaxed. We will rent this unit again!